Sadako Sasaki was born in Hiroshima this week in the war, on 7 January 1943. She was a little over 2 years old when the atomic bomb fell on her city. Her home was a little less than a mile from the point of impact. She died of leukemia at age twelve. Sadako became famous for her project to make a thousand cranes from folded paper. If she were successful then she would be granted a wish, or so it was claimed in an ancient folktale. 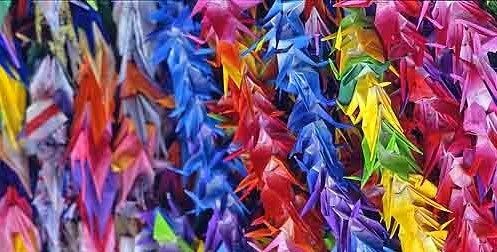 Sadako never completed the full one thousand but her friends gathered after her death and finished folding the remaining cranes. Her statue stands outside the Noboricho Junior High School in Hiroshima, which was where she studied. This entry was posted in World War II and tagged atomic bomb, Hiroshima, paper cranes, Sadako Sasaki. Bookmark the permalink.